Last year I went to my first Tu B’Shevat seder and really enjoyed it. I thought about trying to do something similar for children, but quickly realised that it would be more fun (and age-appropriate) just to make up our own activity. So here’s what we did. I went to the supermarket and bought as many different types of fruit as I could find. 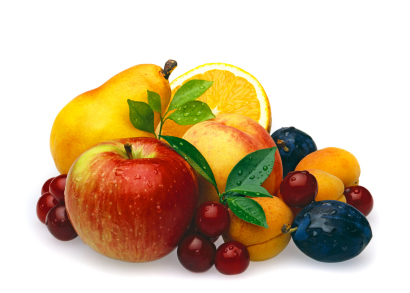 This included: a grapefruit, an apple, a mandarin, a banana, a peach, a plum, a pear, an apricot, an avocado, cherries, grapes, a pomegranate, a lemon, a lime… I mostly chose tree-growing fruits, but any fruits at all will do and I’d have bought other fruits if they had only been in season. Then I sat down with a bunch of 3-5 year olds and we talked about …. you guessed it, fruit. First, I held up each fruit in turn and asked the children if they knew its name. We passed them around so everyone could smell them and feel the texture of the skins. Then, I asked them to tell me which was the largest, the smallest, the longest, what different colours they were, and which fruit looked like another fruit in our selection. Following that, we sorted them into different groups, similar to the fruit types used in the Tu B’Shevat seder. Our groupings were: fruit where you can’t eat the skin, but you can eat what’s inside (like a mandarin or banana); fruit which is easy to bite into but has a hard seed inside (like a peach or apricot); and everything else – which in our case included avocado and pomegranate. Then to finish off, I sliced up all the fruit, and we all got to try a bit of everything, or at least see what it looked like on the inside. For some kids, it was their first experience with a particular fruit. For my daughter, a renowned fruit-avoider, it was a social event which encouraged her to try fruits she had previously rejected without even trying – and surprising herself at how nice they tasted!